Cascia Hall received a Leading Chapter Award from the National Speech & Debate Association (NSDA). From more than 3,600 schools across the country, only approximately 3% of schools are recognized as Leading Chapter Award winners. Leading Chapter schools are recognized based on student participation throughout the school year. 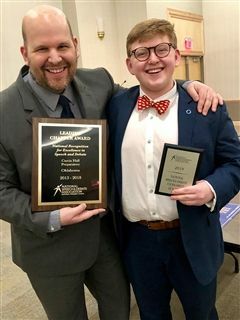 "Speech and debate advances communication skills, develops interpersonal skills, improves reading, writing, speaking, and critical thinking, and prepares students for college, careers, and beyond," said NSDA Executive Director J. Scott Wunn. "Nowhere is this more evident than in our Leading Chapter Schools." The Award was presented at the NSDA District Tournament last weekend at TU to Mr. David Galoob, Cascia's Speech and Debate teacher and coach. He is pictured here with junior Jack Maricle (see related story below).